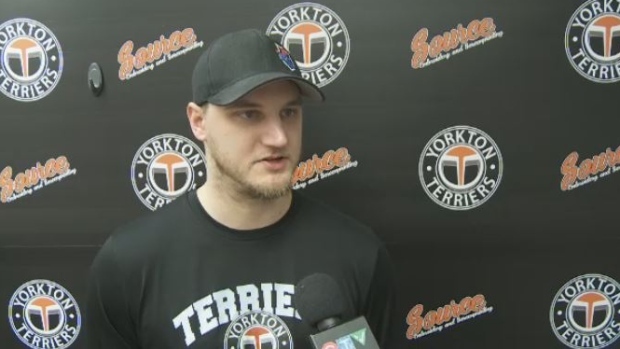 The Yorkton Terriers were eliminated from the SJHL playoffs by the Battleford North Stars on Wednesday night. The Stars completed their sweep of Yorkton at Farrell Agencies Arena. The final score was 3-0, allowed the Stars to advance to the Canalta Cup Final. Terriers Head Coach and General Manager Mat Hehr said he is proud of the team’s accomplishments this season. "I think you can [gain] a sense of pride in the season. [It’s] definitely a step in the right direction for the organization," he said. The Yorkton fans assembling in the arena were anxious. Meara Mullaney’s brother, Mason, plays for the Terriers. “They’ll have to go four in a row, so we’ll see how it goes,” City Councilor Darcy Zaharia said. He was wearing a Yorkton jersey but was skeptical about the Terriers winning. One goal was scored in the first period, with the Star’s Loon-Stewardson netting his sixth goal of the playoffs about five minutes into the game. The goal caused the nearly-1200-strong crowd to fall silent. The Stars’ penalty unit has been extremely strong this season and that strength showed during the second period. Battleford successfully fended off three Yorkton power plays, helped in no small part by goaltender Joel Gryzbowski, who stopped all 31 shots he faced during the game. The Stars scored again in the third period, with Owen Lamb scoring on the power play. Nearly six minutes later the Stars’ Ryan Gil added another. The defeat brings to an end the Terriers most successful playoff run since 2014. It also brings the end to several players’ careers with the team. Almost ten Terriers players will not be returning because they are aging out of the league or leaving on scholarship. The Battleford North Stars move on to the Canalta Cup and will play the winner of the other semi-final. The Estevan Bruins and Melfort Mustangs are tied at two games apiece.